As I promised in VR920 Headtracking driver development here comes a usable version of my headtracking driver for the Vuzix VR920 iwear for Linux. Again I want to thank MalMal of Vuzix Forums, from whose code I was able to learn how to read the Sensor data out of the device via USB. For general Information on how to use the device with Linux see: Vuzix VR920 with Linux and active 3D stereo. I managed to calculate yaw, pitch and roll from the accelerometer and magnetometer data (The device has got three of each). This makes a 3DOF tracking possible and would allow you to look around in a 3D Scene. The driver sends the tracking data via network as UDP multicast, thus many clients may read the data, which makes parallelization more possible, i.e. one could use one machine for rendering and another machine for calculations. In addition to this, the approach to send the data out via network makes the language used for writing the application independant from the language used for developing the driver. The tracking data sent to the clients contains the three angles, yaw, pitch and roll and for easy usage a viewmatrix, one can directly use with scenegraph libraries. If you intend to develop an application using the headtracking of the VR920 see the file democlient.cpp included in the download for details on how to get the data into your application. On the commandline you may specify a multicast address and a port to send the data to. If you choose not to define these values the driver will send the tracking data to a sane default (224.0.0.42:4242). In any case, the client using the tracking data has to join the same address with the same port. You may decide not to use real network, if you only want to use the data on the same machine. In this case you may use loopback networking. After executing the driver it instantly starts to send the trackingdata. Initially it starts in “silent” mode. You may activate/deactivate the monitor mode by pressing the M key. In monitor mode the driver displays the angles for yaw, pitch and roll. 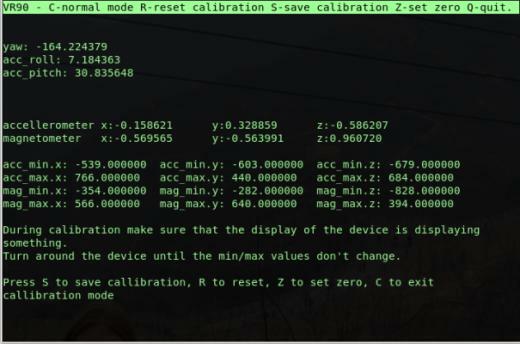 By pressing the C key you can activate/deactivate the calibration mode. In calibration mode the driver displays the most amount of information, the angles for yaw, pitch and roll above the normalized sensor data. Below the minima/maxima of the sensors are being displayed.The calibration works similar to the windows driver, one has to turn around the HMD (with the side-pieces open) until no minima/maxima changes anymore. Afterwards turn the device forward (the direction where you want to have the center of your view) and press the Z key to set the zero direction. Once you have completed calibration press S to store the calibration for future use. Finally press the C key again to exit calibration mode. As default the calibration is being saved to the file .vr920 in the users home. You may specify a different filename using the -c option. If you do so this file will also be in the users home. To use i.e. a global calibration file you have to specify the full path starting with a slash. Important note: During calibration make sure that the display of the device is displaying something. Since the displays not only showing a blue screen influences the sensor data (at least with my device) you’ll end with wrong calibration else. You may use i.e. nvidia-settings to ensure this. For building from source unpack the zip and cd to vr920 and run make. If you use a binary based distribution, make sure you have the devel version of the needed libraries installed on your system. In the future I plan to extend the jps viewer I published in SIV – a stereoscopic jps viewer for Linux to use the tracking data from the driver, so one can look around the scene by turning his head. Very cool! I’m going to have to try this out tonight. You’re SIV jps viewer also sounds very interesting. I hope the driver works for you. It would be nice if you could leave some feedback after you tried the driver, since I can only test it with my device and “my” earth magnetic field. I tried your driver last night and it seems to work. 🙂 I use Debian Sid X86-64 and built it from your source. I’m happy to give feedback. What sort of information is useful to you? I don’t presently know much about magnetometers or accellerometers but I will look into it. Last night, I believe I saw movement on all the axes. I have a win2k machine available that can be used for comparison with the vuzix driver. I haven’t used the vr920 much on windows, but I was never able to get a perfect calibration for the head tracking. In the game Doom3, if I were to look straight up, the view would move a little to side as well. I think the crosshair was also a little shakey. Maybe other programs are better or perhaps I’m just bad at calibration ;). I think I read somewhere that more expensive HMD headtrackers have another sensor in addition the accellerometers and magnetometer. Gyroscopes? I know a little C. I would like to learn how to use your driver. Well, for judging how good calibration works and how smooth and precise the movement is, it will probably not be enough to see the data from the output. Best for this would be an application that uses the tracking data for view manipulation. Perhaps you can try to build SIV on your machine. If the actual version runs on your system (dependencies), the future version with headtracking support will also. So when the new version is ready you could check the movement, then. For learning how to use the driver have a look at the source file democlient.cpp. It should be quite easy to read. The new version of SIV is available now, so if you like, you may try the driver with it. Hi, Jürgen, I want to try your Linux driver, but link to sorce is not working now, some php errors apeared instead driver source. I’m sorry for the inconvenience. Downloading works again. You made me want to buy one of those glasses. Nice, did the driver work for you? Are you building some special application with the vr920 on linux? Congrats for the initiative and good work! I tried flightgear in quad bufferred stereo mode with openscenegraph-2.8.2. This did not work (no stereo display and wrong graphics). (see comment 2 of http://www.mygnu.de/index.php/2010/03/flightgear-2-0-0-on-gentoo/ ). Anaglyph stereo works, but is not the right way for me, with a device like the vr920 there should be true stereo (export OSG_STEREO_MODE=QUAD_BUFFER fgfs), which fails with flightgear. From my experiences the bug should be in openscenegraph or flightgear. I have no idea where one could start to search for it. I don´t suspect the driver to be responsible for it, since I used quad bufferred stereo in some linux projects (with and without openscenegraph) and never had this problem. As I wrote, when flightgear works in stereo I´d like to implement the headtracking feature for flightgear. It should be straight forward, the same approach I used in SIV, my jps viewer. Get the data from the driver via the multicast socket and use it to rotate the osg camera. If you´re interested in how it works, look at the SIV source (VR920TrackingManipulator.cpp). A fake joystick driver can only give half of the experience. In my opinion the major problem of tracking technology is that there is no manufacturer independent interface (like we have for joysticks) for it, so an application has to support each tracking device seperately. But I also don´t have an idea where to start to bring such a standard on its way. Perhaps if others involved in tracking driver development read this and agree to work together on it, this could be the right way to start. I am not able try this out, since my only ubuntu system is still running 10.04 LTS. With the 10.04 version the driver compiles, as well with a current gentoo linux. Well, in the comment http://www.mygnu.de/index.php/2011/03/vrtrack-1-0-headtracking-driver-for-the-vr920-hmd/comment-page-1/#comment-3938 Rodrigo Ventura proposed a patch for the Makefile. I assume he has gotten the same error as you. Thus I suggest to try his way, and please report afterwards if it worked for Ubuntu 11.10. Could you also post the output of pkg-config fuse –cflags –libs, please (there are two minus characters before cflags and libs, cut and paste from the web browser will not work)? If I enter this in my bash I still get the same error..
please try to include stddef.h. There seems to be the offsetof macro missing, which is defined there. Probably it gets included as a dependency on my systems or is defined somewhere else, also. Does this work? Propably the usb_interrupt_read() is making trouble? Indeed! I needed to include and to change the Makefile and now it works! More or less.. I have other goggles, mine is called WRAP 920! Good to know that this works. I am sorry, but the Wrap 920 is not supported by the driver, yet. Since I do not have any of these, there is nothing I can do about this at present. Perhaps I can do something in the near future, but this is not sure yet. Once I can tell more there will be news on the blog. Seems to be related with the HID driver.